Power sector in India is witnessing a radical change on account of government's move towards power generation via renewable energy resources. Increasing electricity consumption and surging awareness towards environment are together helping the country towards utilization of green energy resources, especially solar. Moreover, solar inverter market is exhibiting immense growth over the past few years owing to surging implementation of solar energy projects in the country. Additionally, National Solar Mission, aiming to achieve 100 GW of solar energy by 2022 has further fueled the solar inverter adoption and is anticipated to increase the market in proportion with uprising solar industry in India. According to Anuj Mehrotra, Senior Research Analyst, Research and Consulting, 6Wresearch, "Currently, India Solar Inverter market is primarily driven by utility grade projects majorly ranging from 2 to 100 MW capacity and above. Further, commercial solar installations across educational institutes, airports, railways, corporate offices, and other commercial buildings are anticipated to exhibit highest growth during the forecast period." "Increasing electricity prices, rising investment in smart cities, and increasing awareness among consumers have further led to the expansion of solar inverter market in the country," Anuj concluded. According to Suman Gautam, Research Associate, Research and Consulting, 6Wresearch, "To meet the growing energy demand, India is witnessing rapid growth in solar installations. Residential consumers are significantly adapting to solar power systems owing to rising electricity prices. Also, surging solar roof top and off grid systems are further propelling the demand for solar inverters in the country." "In addition, through subsidies and incentives, government is making remarkable efforts to utilize the solar power capacity in the country. Also, government's focus towards smart cities development is likely to contribute to solar energy adoption which would increase the demand for solar inverters in the country," Suman added. 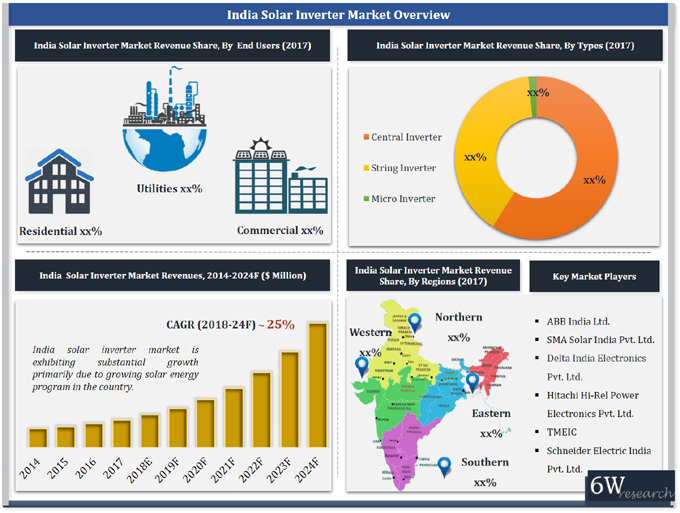 "India Solar Inverter Market (2018-2024)" provides in-depth analysis with 40 figures and 12 tables covered in 110+ pages. The report estimates and forecast the overall India Solar Inverter market by types, system type, end users, power rating, and regions. The report also offer insights on competitive landscape, companies benchmarking, company profiles, market drivers and restraints.